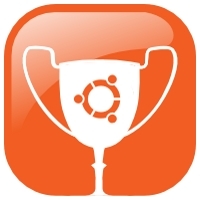 Back in January I first posted about initial progress on the Ubuntu Accomplishments project; an effort to present our users with fantastic documentation and guidance for a range of different community activities and automatically award our users with trophies when they accomplish those activities. The end-goal is to make opportunities on your computer and in your community more discoverable and satisfying when accomplished. Importantly, Ubuntu Accomplishments is not about meaningless awards such as 1000 posts to a forum or 500 bug comments (the like of such can be easily gamed and generate too much noise to signal), but we are instead focusing on awards for new experiences and skills acquisition (e.g. learning how to file a bug, becoming an Ubuntu Member etc). You can see our guidelines for how we decide on what makes a great accomplishment here. Well, after a furious period of development, I am delighted to announce our very first release: Ubuntu Accomplishments 0.1. This first release is a huge milestone in the project: this isn’t just a small GUI app…to build this first milestone involved creating a back-end service (featuring a DBUS API), a Python API to ease writing accomplishments, a server validation service, a graphical front-end, and a collection of community accomplishments to get people started. In addition to this everyone’s favorite Callé…David Callé…has created a Unity lens for the system which we plan on releasing over the next few days too. 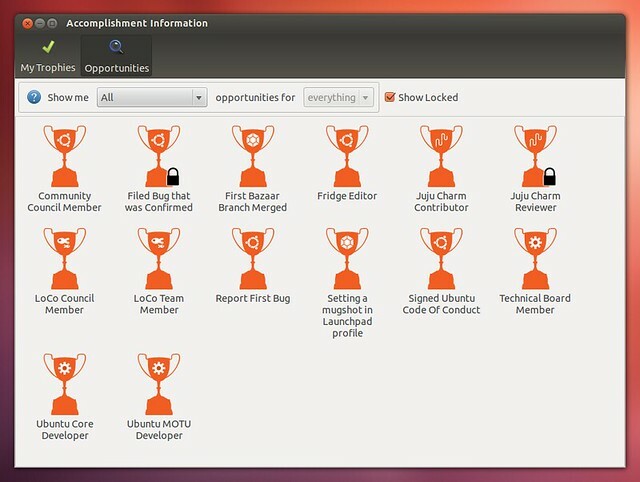 Browse a range of different Ubuntu Community opportunities and filter them based on different categories. Click on different opportunities to discover more about them, what is involved, how to get started, as well as tips and tricks for success. Some opportunities require others to be completed before you can progress: this provides a logical on-ramp for participation. Accomplishments are automatically checked to see if you have achieved them. If you have they are verified to ensure they can’t be faked. The GUI client shows your collection of accomplished trophies as well as the available opportunities. Comprehensive Unity integration featuring Launcher numbering, notification bubbles, and hi-resolution icons. Full translated and available in a range of languages (language support varies due to the early nature of this release…but you you can help translate it!). We also provide a collection of community accomplishments covering Development, LoCo Teams, Juju, Governance and more. We need more accomplishments contributing and I will be talking more over the next few days about how you can contribute. The goal of the 0.1 release was to demonstrate the core system working and I am delighted to share this first release with you. Please note, there is a reason why this is version 0.1 – this is a very early version, so use with caution. There are bound to be some bugs, but we welcome all testing so we can resolve bugs and problems. Thanks! The 0.1 release is only available for Ubuntu 12.04 and is available in a PPA. You will need to have an Ubuntu One account set up and working (you don’t need a paid account, just the free account). You can install the PPA by following these instructions. To use the system simple click on the Accomplishments Information app in the Unity dash. The graphical app will load and if you wait a few minutes you should start seeing notification bubbles arriving that tell you which trophies you have achieved. You can browse the Opportunities by double-clicking on them to read more about them. You can view your collection of trophies by clicking on My Trophies. Unicode decode crash – we have had a report of a translation causing a crash when clicking on an opportunity to view it. You have to start the GUI to start the back-end process. This will be started on login in the future. If you find a bug you can report it here. We are keen to know about all bugs you find! Growing our range of accomplishments in the community to have an expansive collection that covers all parts of the community. Fix up support for local accomplishments so that you can browse opportunities for things on your computer (e.g. sending your first email in Thunderbird) and be awardd trophies for these. Fix bugs reported by you good people to get things rock solid. If you would like to get involved and participate, please join our mailing list. Thanks! What is wrong with that icon? This isn’t oxygen. Why is this a separate application and not part of launchpad? Why not web app to serve other Ubuntu flavors AND older versions too? I’m Kubuntu 10.04 user, so I can’t use it. It is not part of Launchpad as it can support multiple sources, more than just Launchpad. While you can check for accomplishments on Launchpad, it can also check with other providers such as GitHub, AskUbuntu, Ubuntu Forums etc. The system was also designed to be more than just developer-related content, so building this into Launchpad would not have made sense. The back-end service is entirely independent of the client, so if you wanted to write a KDE or web client, that is possible: we just focused on a GTK client for the main version. Ok, that makes sense, but it also locks down to Ubuntu users and contributors using other systems are not able to ‘play the game’. It isn’t supposed to be Oxygen. I hate glossy icons. Tango, and it’s derivatives, are great.